Mike Breen and Dan White Jr have both written this week about the problem of individualism in missional churches this week. My own take on this is there is a missing ecclesiology at the core of the missional movement. The missional church movement often misses just how much the Kingdom of God is a social dynamic in Christian participate in. The resulting social reality is the church as its social visualization. As I said on twitter earlier this week: “The Kingdom of Jesus is always a social reality which individuals participate in. Privatizing it is both the evangelical and liberal mistake.” Evangelicals want to make the kingdom a private personal relationship with Jesus the King, protestant liberals want to make the Kingdom about God’s work in the world in which individuals are sent as good Christians to work for. But either way we miss how the Kingdom becomes visible and flourishes when two or more people (a community) submit to His reign in a space and time and thereby open space for His reign and authority to break in. This is to me the dynamic of mission. Too often the missional church movement has fallen into either the evangelical and/or the protestant liberal mistake. The Anabaptist corrective is that the gospel of Jesus Christ is that in Christ, the fulfilment of the promises to Israel has begun in a commuinity. God’s reign in Christ on earth has begun in the form of a community in and for the world. It is the harbinger of where God is taking the whole world and therefore invites the whole world to see and partake. Today’s “missional churches” tend to default into producing individual missionaries and then sending them out to be missional at their work or in their neighborhood. They tell a message instead of being the message together (from which they can tell the message). They hold a Sunday gathering that pumps up and challenges Christians to join in God’s mission. Then they send them out to be little Jesus’ in their respective places in the world. The problem? This strategy exhausts everybody involved. And gives them a big guilt trip. The church burns out in three to five years. It’s the dirty little secret in the room. It’s important to note that even though many churches plant by sending large groups into a town to plant a church, their logic of mission is still individualistic carrying out this same logic. But God in Christ beckons us to come together, submit to His reign together to a social reality typified by forgiveness, reconciliation, renewal, healing and transformation in the Spirit. The world of this new Kingdom becomes visible in the reality of our lives together – whether that is the social reality of our family, economy, governance, art, meals, conflict. It is extended to whatever space we go and inhabit. Here is this space (which depends on individuals submitting to Christ over their own lives as well) God’s reign and authority in Christ breaks in by His Spirit. Devoid of this social reality, the church is left to become a volunteerist army sending out individuals who get exhausted somehow thinking the work of God is on them. We are left with a bunch of individualist burn out missionaries, another version of the protestant liberal vision of the church as recruitment center for doing the good work of the Kingdom out there. What say you? Is Dave onto something here? 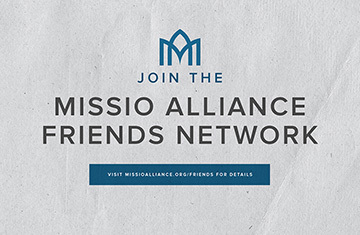 Or is the missional movement generally doing just fine? Also, be sure to catch Dave at the Ecclesia Network National Gathering coming up in just a couple weeks!